The indefinite hunger strike called by Mizoram Underground Returnees’ Association (MURA) entered its 15th day on Saturday even as the State Government of Mizoram has not responded to their demands. The MURA, which is an association of former Mizo National Front (MNF) rebels, has been seeking fulfillment of political agreement that the Mizoram Pradesh Congress Committee (MPCC) had reached with the association before 2013 Assembly elections. 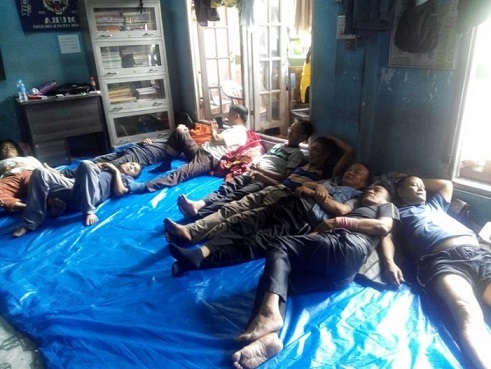 Members of MURA, numbering about 16 to 20, are on hunger strike since June 6 at their office in Aizawl, demanding that the Congress government fulfills its 10-point agreement made before the State Assembly elections of 2013. Notably, the hunger strike was temporarily suspended in the evening of June 15 after Chief Minister Lal Thanhawla agreed to hold talks with the leaders. However, the fast protest resumed on June 19 evening as the State Government did not give any positive response. According to the MURA members, no government officials and medical teams have so far visited the protest site till Friday. As per the political agreement reached between MURA and Congress party in 2013, the latter promised to rehabilitate MURA members by giving housing assistance of Rs 20 lakh each to the members. The Congress party has, however, failed to fulfill its promises except allotting plots of land to only 43 members and giving financial assistance under the flagship programme New Land Use Policy to around 30 members only.